In this tutorial, you will learn Simple thresholding, Adaptive thresholding and Otsu's thresholding. You will learn the functions cv.threshold and cv.adaptiveThreshold. See the documentation of the types for the differences. The method returns two outputs. The first is the threshold that was used and the second output is the thresholded image. To plot multiple images, we have used the plt.subplot() function. Please checkout the matplotlib docs for more details. In the previous section, we used one global value as a threshold. But this might not be good in all cases, e.g. if an image has different lighting conditions in different areas. 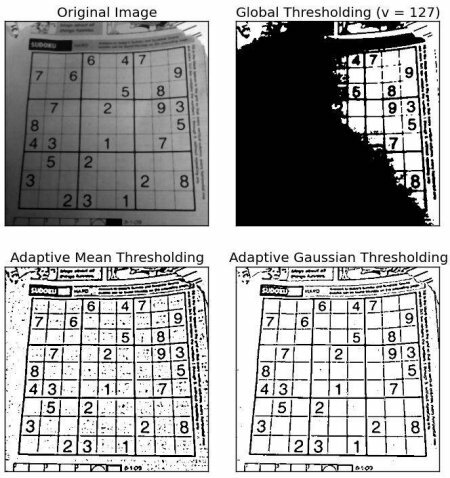 In that case, adaptive thresholding thresholding can help. Here, the algorithm determines the threshold for a pixel based on a small region around it. So we get different thresholds for different regions of the same image which gives better results for images with varying illumination. cv.ADAPTIVE_THRESH_MEAN_C: The threshold value is the mean of the neighbourhood area minus the constant C.
cv.ADAPTIVE_THRESH_GAUSSIAN_C: The threshold value is a gaussian-weighted sum of the neighbourhood values minus the constant C.
The blockSize determines the size of the neighbourhood area and C is a constant that is subtracted from the mean or weighted sum of the neighbourhood pixels. In global thresholding, we used an arbitrary chosen value as a threshold. In contrast, Otsu's method avoids having to choose a value and determines it automatically. Consider an image with only two distinct image values (bimodal image), where the histogram would only consist of two peaks. A good threshold would be in the middle of those two values. 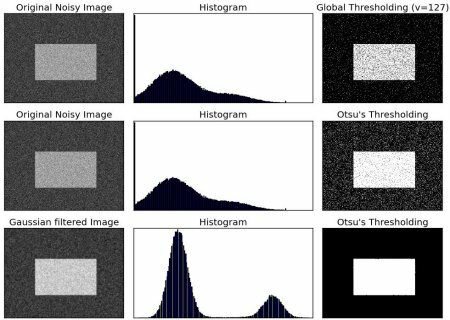 Similarly, Otsu's method determines an optimal global threshold value from the image histogram. In order to do so, the cv.threshold() function is used, where cv.THRESH_OTSU is passed as an extra flag. The threshold value can be chosen arbitrary. The algorithm then finds the optimal threshold value which is returned as the first output. Check out the example below. The input image is a noisy image. In the first case, global thresholding with a value of 127 is applied. In the second case, Otsu's thresholding is applied directly. In the third case, the image is first filtered with a 5x5 gaussian kernel to remove the noise, then Otsu thresholding is applied. See how noise filtering improves the result. How does Otsu's Binarization work? This section demonstrates a Python implementation of Otsu's binarization to show how it works actually. If you are not interested, you can skip this. 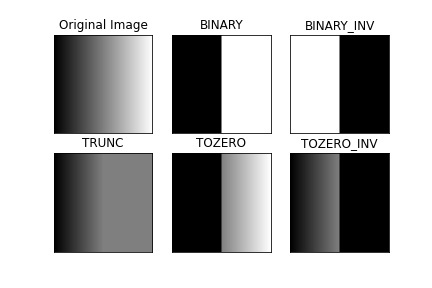 There are some optimizations available for Otsu's binarization. You can search and implement it.